We are excited to announce the release of a number of new products today! In addition to thrusters, there are a whole lot of other things you’ll need to get your underwater creation in the water. Need something to help your ROV float? This Subsea Buoyancy Foam is just what you’re looking for! Comes in four sizes. The Subsea Buoyancy Foam is a machinable, hydrostatic pressure-resistant foam that provides buoyancy underwater (to depths of 300 ft, uncoated or 600 ft coated). Its closed-cell structure is engineered to resist penetration by water. Due to its pressure resistance to many fluids and resins, it is also used in resin-transfer molding as a core material. The foam semi-submersible foam is optimal for shallow to mid-water underwater robotics applications. We also now have Cable Penetrators and Silicone Grease for your water-tight enclosures. It’s been too long since we sent an update! We’ve got a lot to share, both good and bad! There have been a few delays to the T200s and BlueESCs but we’ve got everything back on track and we have a clear path forward. Those of you who haven’t received your rewards have been incredibly patient and we really appreciate it! First, of all, please welcome Elisa and Adam to our team! They’ve joined us at our new office in Torrance, California and they’re dedicated to making sure that our production goes smoothly from here on out. In the few weeks they’ve been working we’ve already had a big jump in production output. Let’s start with the good news: we have production parts of every piece for the T200 Thruster and we have final performance information and charts! The bad news: we only have enough parts for 10 thrusters at the moment and that won’t be resolved for about 2.5 weeks. We’ve spent a lot of extra time with our plastic injection molder and our motor stator winder to get everything just right, but that’s pushed things back a bit. As soon as we have those parts in hand we should be able to get all pending T200 orders filled within about 5-6 weeks. That means most T200s will be shipped between June 23rd and the end of July. Here is another image of the T200 with all production parts. T200 Thruster – Shipping soon. We have a new product available today. It’s a propeller specially designed for the M100 Motor. There are lots of applications where you don’t want or need a full blown thruster, like on small ROVs or surface vessels. Together with our OpenROV Mounting Hardware, this propeller could be used for the forward thrusters on the OpenROV. The propeller has a 68mm diameter and generates about 3.2 lb of forward thrust and 2.6 lb of reverse thrust. There are clockwise and counter-clockwise rotating versions. Thanks to the magic of 3D printing, we can build these in small batches without the need for expensive injection molded tooling. We are selling the propellers here for your convenience, but many of you have your own 3D printers and can print the propellers yourself. We are making the 3D files for the propeller open-source and licensed under CC-NC-SA 4.0. The 3D files are available here for free (and also on GrabCAD). 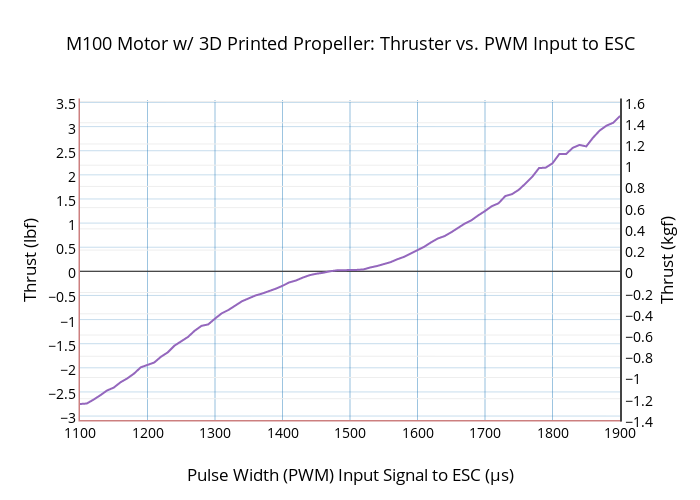 Here is a chart of the propeller’s performance on the M100 Motor. Note that our propellers are printed using the SLS method, but you might get slightly different results with other types of 3D printers. We’re happy to report that we have ordered the first production run of assembled PCBs for the BlueESC. We’ve been testing our production prototypes and we’re really happy with the results! The waterproof and water-cooling aspects of the ESC are truly unique and advantageous. Here’s an image of the production prototype, completely waterproofed and protected in its aluminum enclosure. The BlueESC production prototype. The ESC is protected in thermally conductive potting compound. This update won’t be long because we made a short video to show the BlueESC prototype in action! The BlueESC is living up to all of the specifications that we promised and more. Besides being waterproof and water-cooled, it has temperature, voltage, rpm, and current sensors onboard. In terms of performance, it can handle up to 20V and 25 amps in air. In water, it stays ice cold, even at 25 amps. We haven’t had a chance to test the limits in water yet, but we can guarantee that it will be much higher than that required for the T100 or T200 thrusters. Standard OpenROV Compatible Kits Shipped! It’s been a while since we sent out an update, but we’ve gotten a lot done! We’ve shipped almost 450 T100 Thrusters so far and we’ve shipped out all standard OpenROV Compatible Kits! We haven’t revealed a whole lot about the OpenROV Kit, so most of this update will describe that. Upcoming in the next week or two, we will have reports on the BlueESC and T200 Thruster as well as some very exciting depth testing results. The propeller is 3D printed in polished black plastic and designed to fit the OpenROV vertical thruster position. It uses a similar blade profile and shape as the T100 Propeller. It’s designed for efficient thrust in both directions, which is particularly important on the OpenROV. Many more thrusters shipped + status update! We hope that you are having a wonderful holiday season! We wanted to give you a status update on the project and let you know what’s coming in 2015! We have made significant progress on orders of T100 Thrusters. We sent out a big shipment last week as well as two weeks before. To date, we’ve shipped 285 thrusters and fulfilled orders for 106 Kickstarter backers! Despite that, we’ve fallen a little behind our original schedule. We’re planning to pick up the pace in 2015, especially as we launch the BlueESC and T200. Just so you know, when your order is shipped, we’ll send you a message via Kickstarter. Packages of T100 Thrusters sent last week. The OpenROV Compatible Kits will be shipping in mid-January. We we’re hoping to get them out the door in December, but we chose to spend a little more time optimizing the propeller design for the vertical thruster. The propeller is custom designed and 3d printed for the M100 Motor and the OpenROV kit. Support Forums and Announcing the M100! A number of thrusters shipped last week have been delivered and they are officially all over the world! We’ve got some very exciting news for you in this update! We are introducing our online support forums and a new product: the M100 motor! We’ve been getting a lot of questions over the last few months and now that we’ve shipped quite a few thrusters, we want to introduce you to our support forums. The forums are a place to ask questions about our products and to discuss applications. We want to keep this as simple and helpful as possible. Please sign up for a forum account here! If you’ve purchased through our online store, you may already have an account. Once you’re signed up, you’ll be able to ask questions and respond to others. Note that the forums are still in beta and there may be bugs but we’ll make sure to address them quickly. Please report any issues. If you are an OpenROV Compatible Kit backer, I’m sure you’re still wondering what the “modified T100 thruster” for the vertical thruster looks like. Well, here it is: the M100 Brushless Motor. The M100! Note that on the real motor, the motor shaft extends 10mm out of the motor to attach prop adapters and other hardware. The M100 is a simple brushless motor version of the T100. It uses the same internal components but uses a metal base that has standard brushless motor mounting holes. Its propeller (not shown) is a bit smaller to fit in the size constraints of the OpenROV. Dimensional drawing of the M100 motor. Even if you don’t have an OpenROV, this is a really cool product. 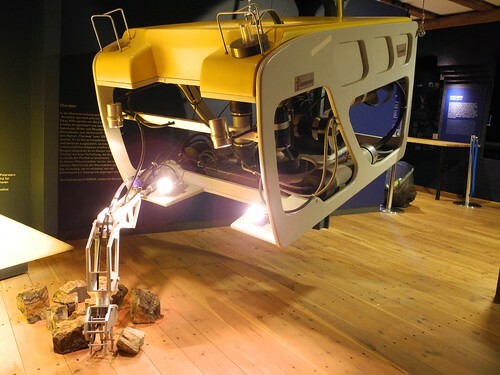 You could use it to make an underwater actuator, camera gimbal, even your own thruster! For instance, if you want to build a thruster into the frame of your vehicle, you can use the M100 to get the same performance as the T100 without all the extra plastic. We’ve added the M100 to our online store, but we won’t be taking any orders for it until most of the Kickstarter rewards have been fulfilled. Check out the item on our store here. We’ll have an “M200” as well in the future. We’ll also be selling a propeller specifically for the M100 as well as the T100 propellers, which fit great on the M100. This is one of coolest parts: solder pads on the motor instead of loose wires. This allows you to solder wires directly to the motor and then seal them with potting compound or liquid tape. No need for waterproof wire splices or underwater connectors! Solder pads for wire connections makes the motor easy to waterproof. That’s all for now! Have a great week and Happy Thanksgiving to those in the US. We’ll have more updates for you soon! Shipping the first thrusters this week! It’s been a while since we’ve sent out an email but a lot has happened – enough for several updates, so will try to send a few over the next few days. Everything is going great! Let’s start with the coolest news. We are shipping the first 100 thrusters this week! Some have been shipped already and the rest will be in the mail by Friday. The shipments are mostly going to early-bird thruster backers as well as a few people who needed their thrusters as soon as possible. Building 100 thrusters in a single batch is a big milestone for us and we want to share what was involved. As you may remember, all of the thruster’s parts are custom, and we order them from all over the world. We still have to do a lot of work here in Redondo Beach to get the thrusters ready to ship. First, here’s some of the “raw” materials as they arrive to us. Some raw parts. Don’t be fooled by the small boxes. We have *18 boxes* of nozzles like the one at top left. It’s amazing how much stuff we need to build all of the thrusters that you guys backed. We are literally up to the ceiling in boxes full of injection molded plastic parts. We have 1,000 cardboard tubes to package the thrusters in. We have 21,000 screws as well as thousands of other components including aluminum shaft collars, steel flux rings, and stainless steel motor shafts. Wound and sealed motor stators. The motor stators are wound and waterproofed elsewhere, fortunately, but we still do some extensive testing here to make sure that they are in great shape. Every stator spends at least three days in ocean water after which it is inspected for any signs of corrosion. Our supplier does a great job and the first batch had a 100% success rate. We’ve been working hard the last few days to make sure that we could ship thrusters this week. Here are some pictures during the production process. We’re going to go into more detail about the tools and processes in a future post, so we’ll just show pictures of the in-process subassemblies here. Stator bases while installing PCBs (left) and after stators and cables have been installed and sealed (right). The ends of the cables are sealed into the sealant so that water cannot leak through the cable and into your vehicle. Here are the assembled and coated rotor assemblies. They consist of a steel flex ring road or base stainless steel motor shaft, and 12 custom arc magnets. They are coded in a tough protective coating that resists both abrasion and water. Here are the motor cables, with the ends stripped and ready to be attached to the thrusters. The cable is a tough urethane jacketed cable that can handle abrasion and is very water resistant. Here’s a pile of finished thrusters. Have you ever seen so many thrusters in one place?? Each thruster is carefully packaged into a cardboard tube that protects it during shipping. The cardboard tubes are shipped in rectangular boxes for extra protection. Each thruster comes in a protective tube and includes a counter-rotating propeller and mounting bracket. Here’s all of the thruster tubes that are shipping this week! Packed thrusters ready to go! That’s all for now. Some of you will be receiving thrusters next week! We’ll follow up with some more updates in the very near future. We’re going to cover the manufacturing process and tools, updates on OpenROV and BlueROV, and then talk about documentation, forums, and user contribution! Things will be a little slow here during next week (Thanksgiving in the US), but we are expecting to ship the next batch by December 12th. If all goes well, we plan to have all T100s that were ordered without BlueESCs to be shipped in December. That will also include the OpenROV kits. We’re hoping to ship BlueROVs by early January. If you have any questions/comments/concerns, please feel free to email us at info@bluerobotics.com.